Monday morning the kangaroo court was in session. Soon-to-be-gone Sen. Bill Stoltze, as he has frequently been want to do during his time in the legislature, attempted to slyly score political points against an enemy while maintaining a Gomer Pyle-esque “I’m too clueless to be cunning” facade. It was also pretty hilarious to see Stoltze’s staff do a presentation consisting mostly of “the media said” considering he and his colleagues spend most of the time in their press conferences bemoaning how poorly and inaccurately the news media reports on them. The legislative hearing Stoltze oversaw was called to look into irregularities at Alaska polling places during the August 16th primary election. There was blame to be laid, but unfortunately, Stoltze and company were so hell bent on selling the Trump-ish narrative that the system is rigged to rouse the conservative base by merely speaking of voting irregularities that they completely missed the rightful criticism that overseer of elections Lt. Gov. Byron Mallott deserves. But let’s start with what the hearings uncovered. The presentation by Stoltze’s staff listed four identifiable voting issues. Two of the items listed either aren’t a real problem or are easily explained. 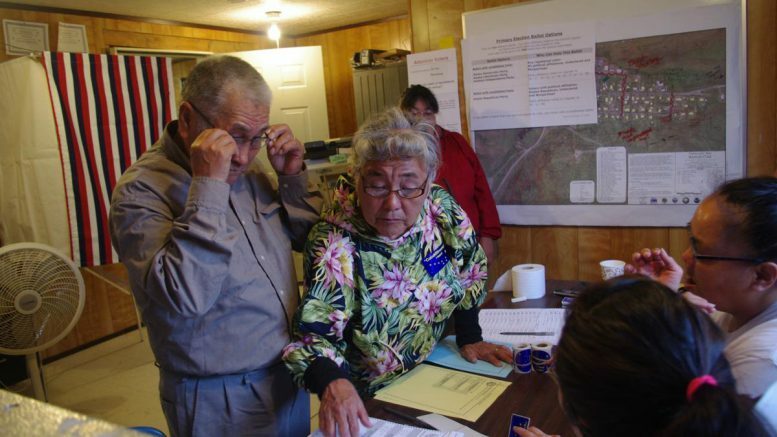 The District 38 – Newtok situation, where it appears the voter turnout was 105.58%, was put to rest by Division of Elections (DOE) Director Josie Bahnke as a simple data entry error that was quickly corrected. There were no voting issues in that case. In The District 6 – Copper Center precinct case, the results weren’t posted for ten days after the election. While that is annoying to those of us who watch elections, it isn’t a violation of any statutes or regulations. It also isn’t in itself an indication anything inappropriate happened. Since there was no race that precinct could have swayed, time wasn’t a factor for DOE. Then there are two cases where something either might have happened or did happen. The District 38 – Chefornak is similar to the Newtok irregularity; however, Bahnke didn’t state a specific reason for the anomaly as she did in D-40 case. As such, we don’t know at this point if there is a satisfying explanation. What we do know is this same type of error happened two years ago under the Parnell administration. Strangely, neither Stoltze nor any of his colleagues expressed any concern over the issue at that time. 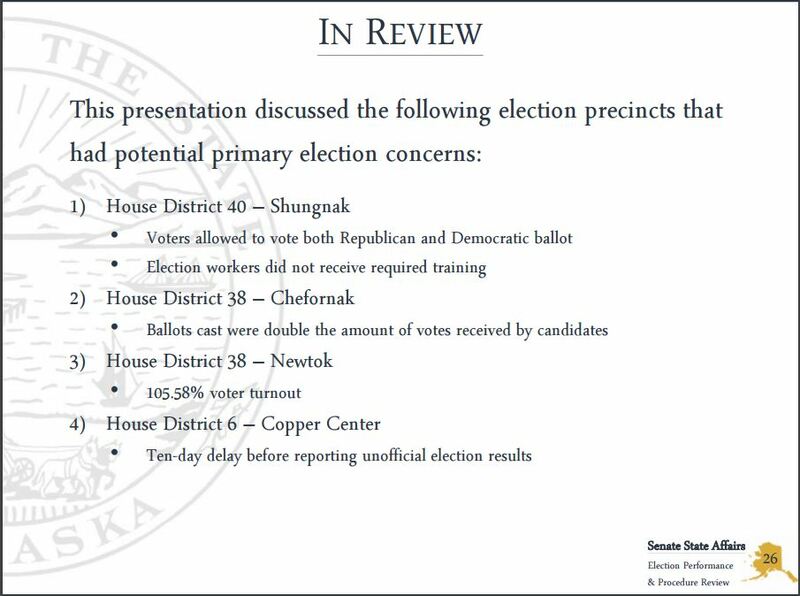 District 40 – Shungnak is the only identified instance in which it is clear voters voted inappropriately. According to statements by DOE officials, voters at this precinct were given both Republican and ADL ballots and allowed to vote on both, rather than one or the other. As Lt. Gov. Mallott pointed out, however, no race was on both ballots, so no one voted twice for the same person, they just got to vote in more races than they should have been allowed. Overall, this is a massively overblown attempt at creating a scandal. There was no evidence or even the credible suggestion of an effort by Bahnke, the Lt. Governor, Governor, or anyone else to sway the election. There was also no evidence that anyone was denied their right to vote, anyone who shouldn’t have voted was allowed to, or that someone voted for the same person more than once. Also, THERE IS NO EVIDENCE ANY OF THESE ISSUES SWAYED ANY RACE. These are all minor, but fixable problems. More importantly, playing to the government conspiracy crowd is drowning out a legitimate criticism that this situation should be generating towards the Walker-Mallott administration. It is a boring old good government argument, so brace yourself, there will be no political grandstanding, scapegoating, or base playing to follow. I’m pretty sure Sen. Stoltze just stopped reading. The real fact of the matter is Alaska got off lucky in this election. That such errors were so small and didn’t sway any individual race was a minor miracle. Why? Because last July Lt. Gov. Mallott made a choice. He prioritized a pet policy priority over well-functioning elections across the state by ousting the sitting DOE Director Gail Fenumiai for Nome City Manager Josie Bahnke. Fenumiai was a longtime DOE staffer who rose to Director in 2008. She was well respected on both sides of the aisle and had shown herself capable even under the strictest scrutiny brought on by the contentious 2010 U.S. Senate race that featured the unprecedented write-in campaign of Sen. Lisa Murkowski. Running elections isn’t like many other areas of government. It takes experience and knowledge specific to how the internal dynamic of elections work and how they can go off the rails. It also takes not just a familiarity with election statutes and regulations, but an instinct for how to navigate them in the real-time pressure of election day craziness. Most of all, it takes enough command of the subject matter to be able to explain to the media and legislators, like they are five-year-olds, what has happened, what is happening, and what will happen. Lt. Gov. Mallott watching rural elections on Aug 16. Those are all skills it takes time in the trenches of elections to acquire. Based on the Senate State Affairs meeting Monday, Bahnke lacks them ALL. Don’t get me wrong; I’m not claiming Ms. Bahnke is incompetent or a poor administrator. In fact, there is no reason to believe she won’t make a capable DOE Director in time. But she, and frankly anyone in her position with less than a year of experience, simply doesn’t have command of elections issues and activities to do the job well. Absorbing all that goes into statewide elections takes time and Ms. Bahnke simply doesn’t have it yet. So why did Lt. Gov. 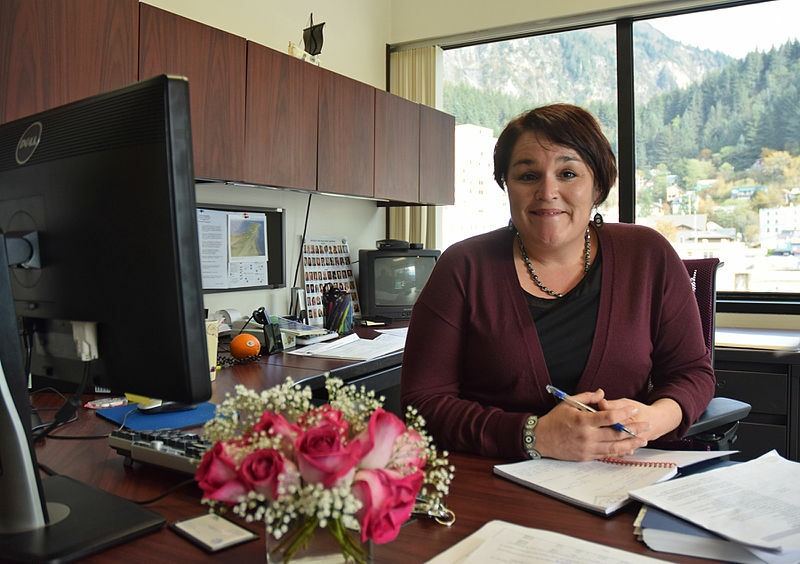 Mallott go from the experienced and proven in Fenumiai to the completely inexperienced Bahnke with less than a year before the next statewide election? That gets to the heart of it. Mallott wanted someone in DOE who would make his priority of language access for rural voters their priority. He wanted a rural person. He wanted his person. And whether he acknowledged it out loud or even to himself, he was willing to sacrifice the short-term integrity of elections around the state to get it. Now, there are reasonable Alaskans, and you may be one of them, who think that is a worthwhile trade. I am not among you. I believe that well-run, credible, secure elections should always be priority one at DOE. Everything else, regardless of how noble, should be second to that. Mallott did the exact opposite. By Mallott hiring such a clearly unqualified and inexperienced political appointee he has likely derailed DOE for years to come. When the next Republican Lt. Governor takes office, there is no way they will be able to keep on someone who is clearly a Democrat political operative in that position. That future Lt. Governor will have to replace Bahnke, washing away all of the competencies she will have built up. 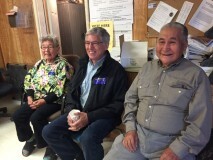 If they also follow Mallott’s example and hire someone equally inexperienced, but politically like-minded, for the job, Alaska elections will once again be at risk. That is what Republicans can and should be criticizing. But that takes an adult argument about the proper functioning of government rather than dog whistle phrases about a rigged system and comparisons to third world elections (I’m looking at you Liz Vazquez), so let’s just say I am less than enthused about things going that way. Be the first to comment on "Everyone Is Taking The Wrong Lesson From Monday’s Election Hearing"